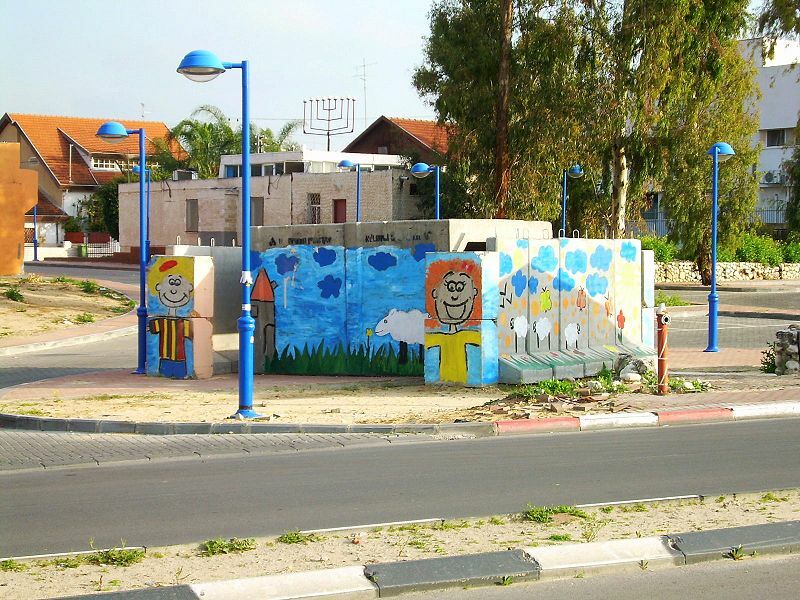 Bomb shelter in Sedorot, Israel where Israelis until recently only had 15 seconds warning of incoming Qassam rockets. In Sherlock Holmes stories, the dog that didn't bark is considered significant. That is not true when it comes to the Israeli-Palestinian conflict where only bad news is considered news. It is now four months since the Egyptian-brokered Israeli-Hamas cease-fire went into effect. According to Alex Fishman, the security-minded Yediot Achronot military correspondent, the "agreement has resulted in an almost complete cessation of Kassam rocket fire" on Sderot and other Israeli towns. Four months of calm may not seem like much to those of us living here. But in a town where residents had, until June, routinely been given a 30 second warning of an incoming rocket, it is a long time indeed. Now the Israelis have to decide whether or not they want to extend the cease-fire for another six months. Defense Minister Ehud Barak favors extending it indefinitely, although he may be resisting the Israeli side of the bargain—easing the blockade of Gaza. Of course, few people here even know that the cease-fire is holding and that Hamas is scrupulously enforcing it. In fact, I imagine many believe Hamas is still firing those rockets, despite the evidence. The very thought that Hamas actually adheres to agreements is, for some, an inconvenient fact. Another inconvenient fact is that Egypt has been effectively working to shut down the smuggling tunnels between Egypt and Gaza. Fishman reports that Israeli officials "praise the Egyptians' achievements in discovering tunnels to and from Gaza." These officials note that the Egyptians "successfully nabbed part of a terror cell operating in Hezbollah's service, which was planning the kidnapping of Israeli tourists in Sinai." You won't read about that in those direct mail appeals from pro-Israel organizations whose raison d’être is to convince Jews that the situation is bad and only getting worse. And that even the Egyptians are not to be trusted. Fear is, quite literally, these organizations' bread and butter. But facts are facts. Then there is the continuing good news from the West Bank where General Keith Dayton has helped transform some violence-ridden population centers—starting with Jenin but moving into other towns—into veritable islands of tranquility (at least by West Bank standards). For years, Americans and Israelis have demanded that the Palestinian Authority crack down on local terrorists and gangsters and, under Salam Fayad, it is happening. Here is what Amos Harel and Avi Issacharoff have to say in Ha'aretz: "Four and a half months after the Jenin project began, it is proving a big success. The Shin Bet security service has received very few intelligence warnings about attempts at terror attacks emanating from the region, and clashes with the IDF have almost subsided. Commerce and industry have improved and, what is most important from the Palestinian perspective, order has returned to the streets." Things will improve further if Israel gives a boost to the Palestinian economy by dismantling unnecessary and redundant checkpoints (rather than continuously adding more). You can't do business if your customers and your inventory are held up at internal checkpoints. The important thing is not to let Jenin First become Jenin Last. Replicating the Jenin model is imperative. Along those lines, I want to offer a "shout out" to Congresswoman Nita Lowey, chair of the House State and Foreign Operations Appropriations Subcommittee. Lowey controls the foreign aid purse strings in the House and made sure that General Dayton had the funding he needed to make Jenin possible. Without her, it would not have happened. Also on the Washington front, I attended the annual banquet of the American Task Force on Palestine (ATFP) last Sunday. The keynote speaker was Prime Minister Salam Fayyad who issued a stirring call for implementing the two-state solution. There were several other speeches and various greetings and messages. But there was not a single anti-Israel statement. Speakers decried the 41-year occupation but there was not one anti-Israel remark. ATFP sent a clear message of friendship for Israel and Jews. By way of contrast, the loudest cheers at AIPAC (and other Jewish organizational events) are often reserved for those speakers who indulge in the most paranoid and extreme Arab-bashing. To their credit, these Palestinians have turned the page, in large part due to the leadership of Palestinian-American physician, Ziad Asali, his wife and partner Naila Abed Asali, and the American Task Force, the organization they founded. Perhaps most impressive was that this event was happening at all. A dozen years ago, Palestinians were on the margins of acceptance here in Washington. Few respectable types—let alone U.S. officials—would allow themselves to be seen at a Palestinian event where, of all things, the Palestinian national anthem is sung along with the "Star Spangled Banner." But this year I saw dozens of prominent officials, including Deputy National Security Council Adviser Elliot Abrams, enjoying themselves among Fatah-supporting Palestinians. Not an image I'll soon forget! Things have changed since Golda Meir preached that there was no such thing as Palestinians. The Palestinians have been "mainstreamed" which means that at long last their voices are being heard in Washington. Whether or not the next administration will take action to address their legitimate needs—and Israel's as well—is an open question. But even here there is good news. In three presidential debates, neither John McCain nor Barack Obama issued those pointless and demeaning statements of support for the Middle East status quo. The lobby had supplied both of them with the usual claptrap rhetoric that previous candidates have uttered but which few, if any, really believed. After all, how could any politician smart enough to be a candidate for president believe that Israel is always right and the Arabs always wrong or that it is in America's best interests to exclusively identify with one side? Instead, this year both presidential candidates have put out position papers stating their support for Israeli-Palestinian negotiations toward implementation of the two-state solution. (Since Giuliani left the race, there has been no candidate promoting the neocon dream of war to the death for Israelis and Palestinians). Avoiding simple-minded hawkishness on Israel is good politics. According to the just-released American Jewish Committee poll of American Jews, Israel ranks number six on the list of issues Jews consider when they vote for president. Three percent cite Israel as compared to 54 percent of Jews who cite the U.S. economy (this was before the stock market collapse) and the large numbers citing health care, Iraq, and other domestic concerns. This is not to say that American Jews do not care about Israel. They most certainly do. But when it comes to voting for president, the Israel issue is barely a blip. That is because Jews know that in this election both candidates are pro-Israel and also because they understand that mouthing lobby-crafted formulations about Israel does nothing to advance its security. They certainly aren't buying the lies being circulated in partisan "hate" e-mails. Jews have been called a lot of things. "Stupid" isn't one of them.